Do you want to learn or improve your level and your skills in kitesurfing? Visit Addict Kite School Tarifa! With their team of certified and passionate instructors, they will do the best to ensure you to have some great holidays, learn a lot and leave Tarifa with a lot of good memories. From the beginning of your kitesurfing courses, you will feel the whole potential of the sport. Try to learn to kitesurf in Tarifa during your holidays and you will surely escape your daily stress, meet new people, do sport, live a new experience, and much more. During thois kitesurfing camp in Tarifa, you will have the option to stay in a private apartment or in a shared house. There are very well-located within a two-minute walking distance from the old town of Tarifa where you will find restaurants, bars, and shops. Their locations are perfect to pass some relaxing holidays. The kitesurfing course is designed, prepared, and adapted personally to everyone, at all levels and every goal. With 10 years of experience, Addict Kite School Tarifa has noticed that everyone learns differently and at their own pace. That is why they have designed all the kiteboarding lessons with the individual flow and personal advice. During the kitesurfing lessons in Tarifa, your progression and improvement are the main priority. The program guarantees you a maximum of two students per instructor with the use of one kite each. During the kitesurfing lessons, you will receive all the attention from the instructor, progress faster as you do not have to share the kite with any other students, and enjoy your time at the maximum. For the beginners, five days of kitesurfing lessons with three hours a day will give you all the knowledge to become an independent and safe kiteboarder. For people with an intermediate or advanced level, the course will be perfect to get you to the next level, improve your techniques, or learn some new tricks. For the more advanced students, you will not start from zero. The teachers will make sure to refresh everything that you learned in your previous course and will continue your training from where you stopped. This kitesurfing camp will take place in Tarifa, Spain. With 300 days of wind per year, warm temperatures, large beaches and some good parties, Tarifa is one of the most famous places in Europe for kitesurfing holidays. Tarifa offers different beaches for the kite lessons, depending on the wind direction, intensity, and tide. In order to learn in safe conditions and enjoy your kite lessons at the maximum, the school will choose carefully every morning the beach where the lessons of the day will take place. It will either be in Los Lances, which is three kilometers from Tarifa Town, or Punta Paloma, eight kilometers from Tarifa. 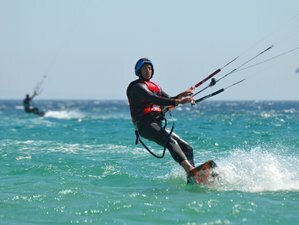 During your stay in Tarifa, you can also enjoy other activities such as surfing, biking, climbing, hiking, diving, wakeboarding, horse riding, carting, whale watching, shopping, an excursion to Tangier in Morocco, visiting the surroundings of Tarifa, and relaxing. Please book your flight to arrive at Gibraltar International Airport (GIB), Jerez Airport Airport (XRY), Málaga Airport (AGP), or Seville Airport (SVQ). From those airports, you will have different options such as taking a bus, car rental, or shared ride. You can check the companies "Comes" and "Avanza Bus" to check the prices and book your ticket. Addict Kite School is an official kitesurfing school based in Tarifa. They organize kitesurfing holidays in the best way and want to share their passion. This vacation is available all year round, please select an arrival date below.